Apparatus For Isolated Uterus Intestine India, Apparatus For Isolated Uterus Intestine Manufacturer, Apparatus For Isolated Uterus Intestine Suppliers & Apparatus For Isolated Uterus Intestine Exporters in India. 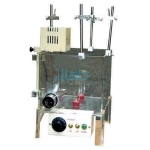 JLab is renowned Exporters & Manufacturer of Apparatus For Isolated Uterus Intestine & Scientific Lab Instruments India, Apparatus For Isolated Uterus Intestine Exporters, Educational Science Lab Instruments Suppliers India. Apparatus for Isolated Uterus, Intestine having a complete Teak base board / Acrylic sheet & bath.